I love crazy engine swaps, even if they turn a car from daily-drive-able to totally useless. 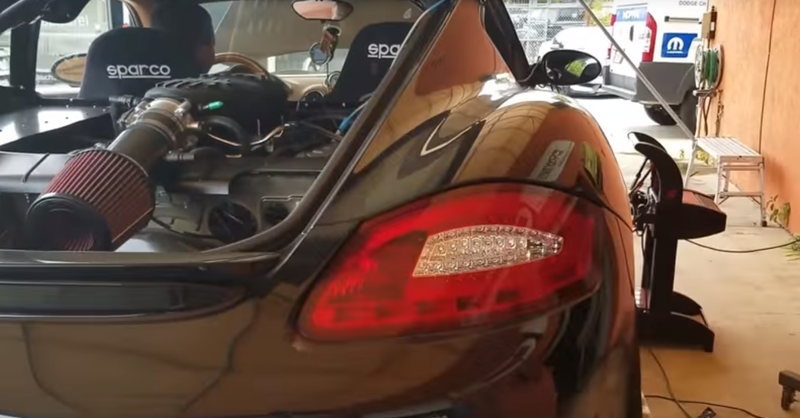 Here’s a Porsche Cayman—a car normally fitted with a mid-mounted, low-slung flat-six— but with a big 5.0-liter Coyote V8 swapped in. It may sound like blasphemy, but just watch how much power this thing makes on the dyno. Since it came out in 2006, the Porsche Cayman has been an excellent driver’s car, in part because of its low-mounted flat six bolted in the middle. That made the car very balanced and less prone to rolling in the turns. Well, someone (in Florida of course) decided they didn’t care that much about a low center of mass, and just wanted raw unadulterated POWER. So they chucked in a Mustang 5.0-liter V8 that totally doesn’t fit. Well, it sort of fits. It’s still between the front seats and the trunk’s firewall, except now the top of the engine pokes out and sends the air intake into the trunk. But whatever. 428 horsepower and 364 lb-ft of torque at the rear wheels? I think I’d be okay with slowing down a bit for the turns; I’ll just make up for it in the straights.